I hope you have enjoyed all of the Win Giveaways Father’s Day Bash Posts that I have been posting this week! My final giveaway for this bash is courtesy of TruGreen, and I have a feeling many of your dads would love the gift of lawncare service! TruGreen makes maintaining your lawn easy by delivering customized care solutions that are effective, innovative and responsible. They listen to you and, after a thorough inspection, they will recommend a solution that’s right for you and your yard. Clean Area: Thoroughly clear dead leaves and debris from flower beds and lawn that may impede new spring growth. Prune: Conduct corrective pruning of trees and shrubs to enhance plant appearance and vigor, and thin rather than top-shear overgrown shrubs and trees to preserve their overall shape. Make sure not to prune trees and shrubs that bloom in early spring, with the exception of removing dead branches. Mulch: When your lawn is actively growing, return grass clippings back to the soil for added lawn nutrients and consider using composted materials to nourish plants. Apply three inches of organic mulch to base of shrubs and trees to help conserve soil moisture and to reduce weed pressure, but be mindful not to cover the flare of the tree base. Right Plant, Right Place: Plant the right type of grass for your lawn to ensure a green, healthy turf. Where grass has difficulty growing, plant shade-adapted ground covers for landscape appeal. Feed: Spring lawn, tree and shrub roots seek nourishment after the dormancy of winter. Keep fertilizer on target to prevent run-off and sweep fertilizer granules that may reach pavement back onto your lawn. Use a trained professional company, such as TruGreen, that offers customized solutions to lawn and landscape problems based on your region’s needs. Check Irrigation: Follow the owner’s operating manual to take an automated sprinkler system out of hibernation. Ensure sprinkler heads and related water lines are working properly. Give your lawn a slow, steady watering about once a week, but adjust depending upon rainfall, grass and soil type in your area. Also ensure the irrigation system covers your landscape efficiently. For example, you can place a one-inch deep food can in the middle of the lawn area to measure the depth of water collected after each watering cycle to ensure uniformity. Protect Against Elements: The beautiful blooms of spring are vulnerable to frost. With an expected cold snap, cover flowering plants before the sun goes down to maximize heat trapped by the plants. Create a tent of warmth with plastic tarps, cardboard, bed sheets or special plant frost protection blankets available at your local nursery or home improvement retailer. Interested in creating a Outdoor Oasis? I bet you could with $25,000! TruGreen is celebrating real stories for creating your ideal outdoor living room by offering the TruGreen TruStories Sweepstakes through October 16, 2011. One Grand Prize winner will win a $25,000 MasterCard gift card, which would be perfect for creating your perfect outdoor space. There are only prizes too. See complete details www.TruGreenSweepstakes.com/win. To get kids interested in the diverse plant world, TruGreen has collaborated with Memphis Botantical Garden to launch My Botanic Planet. This is a FREE (we love FREE) online educator resource to inspire elementary students interest in the plant world. Visit www.mybotanicplanet.com to access lessons in botany and related games & activities for your child. 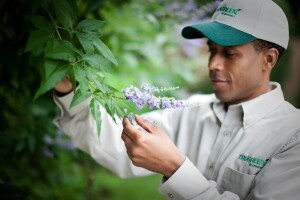 How would you like to win a $125 TruGreen gift card? One lucky Stretching a Buck reader will win a gift card, which is good for approximately two TruGreen treatments for lawn, tree, and shrub care. This post sponsored by TruGreen as part of the Win Giveaways 2011 Spring Giveaway Bash. This post was written by me and was not edited by the sponsor. Read more in my disclosure policy. Find more information on the terms for this giveaway on the Win Giveaways Facebook page. My husband, Dan, does most of the yardwork. He works hard to keep it nice and green and I love him for it. My husband does all the lawn care but he has so little time to devote to it. This would save him a ton of time and allow him to spend that time with his three little girls instead. My husband does most of the yard work. But I just quit my job to stay at home with our daughter so I am afraid that might change! My husband and I share the lawn work. We enjoy planting, trimming and pulling weeds together! My husband does most.of the yard work. I help with the garden beds…but he definitely does the hard labor. My husband does the yard work. I do all of the yard work, and would love the help. My hubby does the yard work, he’s been trying to get rid of the weeds, but this year the weeds are winning! We share the responsibility at our house. I would rather work in the flower bed! Hubby does the yard and I work in the flower beds! My husband does most of the yard work at our house! Son mows the lawn, I plant and garden, Hubby helps sometimes. We need some help for the lawn though, just moved here and it is mostly weeds. My husband does the yard work! My husband does the majority of the yard work with our boys helping when they are available. My husband does most the yard work. I do try to keep the front yard mowed. I live by myself so I do all the yardwork! My husband and I split the duties. I hate it! My husband takes care of our lawn and my parent’s yard! I would love to win this giveaway so he can have a break! I’m a subscriber… I enjoy reading your emails. My husband does all of the mowing and weed-eating, and I do all of the gardening and “delicate” flower and shrub care. And I subscribe to your blog via Google Reader (RSS). My husband does most of it. I’ll do some of the little stuff. My husband does most of our yard work right now. I do most of the yardwork at this house! I do most of the yardwork but I enjoy it most of the time. My dad does the yard work! Hubby does most of the work. A local lawn care/landscaping business. My husband does almost all the yard work. The kids and I do a little weeding, but other than that – he’s on his own! I subscribe to your email and do ALL of the yard work. My husband does most of the yard work! My teen daughters do most of the yard work. Well, I am the one that does all the yard work but I love it. I love my flowers too. “Like” Stretching a Buck on Facebook as Georgia C.
My husband does all of the lawn care at our house. My husband does the majority of the yard work. I’ll deadhead flowers or pick fresh veggies from the garden but he does all the dirty work. I ‘like’ you on Facebook, and I shared. The tractor & push mower do most of the work! My husband and I share tasks almost evenly. My husband does most of the yard work. My husband takes care of the outside and I take care of the inside. I do the gardening while my husband is in charge of the lawn. My hubby for sure, especially this hot summertime! Hubby takes care of the yard. My poor husband does all of our yard work. Last year he spent months getting our lawn beautiful and green and this year none of the grass came back. The whole yard is dead and brown. Poor guy! Our lawn could really use some help! Definitely Hubby…I am not a fan of the outdoor work…just relaxing on the patio!! Hi – my husband does most of the yard work but the weeds are controlling him and not vice versa.